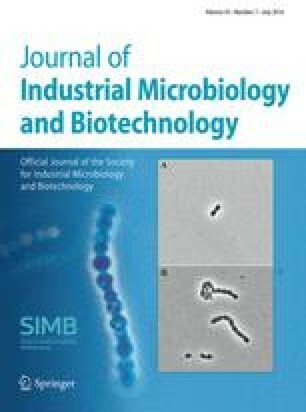 Several antifoam agents were evaluated for the ability to control foam in the production of Bacillus thuringiensis-based biopesticides using sewage sludge as a raw material. Experiments were conducted in shake flasks as well as in 15 l fermentors with controlled parameters. Polypropylene glycol (PPG), the most commonly used antifoam agent in B. thuringiensis fermentation, inhibited cell growth, sporulation and decreased the entomotoxicity yield even at a concentration of 0.1% (v/v) in sewage sludge medium. About 40% reduction in entomotoxicity was observed when PPG was used at 0.3% (v/v). The impact of PPG on sporulation and toxin synthesis in tryptic soy yeast broth (TSYB) medium was also studied. The inhibitory effects were less severe in TSYB than in sludge medium. Another silicone-based antifoam agent, “Antifoam A”, showed less severe effect on growth and stendotoxin production. The problem of the inhibitory effect of chemical antifoam agents on growth and endotoxin production was minimised substantially with the use of vegetable oils such as canola, olive, and peanut oils. Canola and peanut oil stimulated both sporulation and δ-endotoxin synthesis. The stimulus effect varies with the monounsaturated fat contents of oils. Journal of Industrial Microbiology & Biotechnology (2000) 25, 86–92.